Conclusion: How to Move Angola Forward? Angola today is framed by a history of violent conflict that has left the population far behind on all major indicators. Lacking a democratic culture, the country faces two significant challenges: first, the challenge of completing a long-stalled transition to democratic rule; and second, changing government from a body that serves the personal interests of its members to one that more broadly benefits the population. Contemporary Angola must be regarded as the product of a deeply conflicted history. From the moment independence was declared in November 1975, the country was launched into an intense civil war that in the end claimed up to a million lives, destroyed most legitimate economic activity, and rendered vast swathes of the country useless, inundated with landmines. As a result of this legacy, there now exists a “generation of mutilados”—‘mutilated ones’—within the Angolan populace (Meredith 2006: 610). Indeed, Angola’s post-independence history reveals the enduring role that violent conflict has played in shaping the country today. 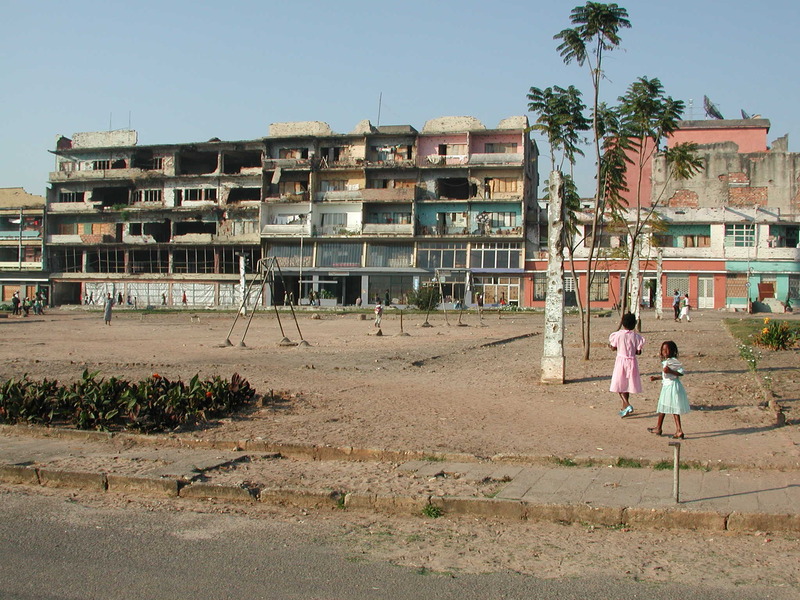 Angola, writes Handelman, has “suffered enormous devastation with little or nothing to show for it” (2009: 245). Though today the violence has largely abated—after 27 years of civil war—the transition to democratic government has presented a serious hurdle to a country in which one president, entrenched in his office, has ruled the country for 30 of its 34 years as an independent state; President José Eduardo dos Santos of the Popular Movement for the Liberation of Angola (MPLA) has been in power since his predecessor’s death in 1979 (U.S. Dept. of State). Despite the adoption of a multiparty system in 1992 (Meredith 2006: 604-607), the President and his party continue to maintain de facto autonomy within Angola (U.S. Dept. of State). Effective government is further hampered by a culture of graft; Angola is reputed to be one of the most corrupt countries in the world, with Transparency International rating the country in the bottom 20 (#162) of the 180 countries in its 2009 Corruption Perceptions Index (Transparency International 2009). In fact, corrupt government associates are so much a figure of public society in Angola that they have earned their own notorious nickname: the term futungos has been adopted, named appropriately after the Presidential headquarters at Futungo de Belas, to describe the well-connected network of friends, family, and colleagues who dominate the Angolan political and business world (Meredith 2006: 613). Angola still has a long road ahead on the path of recovery and development in the post-civil war era. In the face of these numerous challenges, and with the end of violent conflict in 2002, Angola has become Africa’s fastest growing economy and the fifth fastest growing economy in the world, due almost entirely to oil wealth (CIA 2008; McMillan 2005: 156). In spite of this recent growth, the most significant challenges facing Angola today remain in large part the same as those that have vexed it for many years: completing the long-stalled transition to democratic government, and finding a path towards equitable growth that more broadly benefits the population. Angola does not posses a democratic tradition. More than 400 years ago, the current capital city of Luanda was founded by the Portuguese as a major hub for the slave trade, serving to kick-off hundreds of years of oppressive rule (BBC 2009). Portugal continued to consolidate power in the subsequent centuries, and in the period from 1885-1920 effectively occupied Angola and established the country as an official Portuguese colony (Henderson 1979: 105). After decades of exploitation under the colonial system, independence was finally granted and declared in November 1975 (Henderson 1979: 23); the independent spirit, however, was short-lived as fighting between rival political groups ensued almost immediately, turning Angola into one of the Cold War’s bloodiest proxy battlegrounds. As a “pawn in the Cold War,” Angola was infused with arms, soldiers, and support from the U.S., Soviet Union, Cuba, South Africa, and Zaire (DRC) (Meredith 2006: 313; 600-601). In particular, the U.S. supported the National Union for the Total Independence of Angola (UNITA), led by the charismatic and power hungry Jonas Savimbi, and the Soviet Union supported the MPLA, led for most of its history by current President José Eduardo dos Santos. South Africa sent combat soldiers in support of UNITA and Cuba sent an astounding 50,000 troops to support the MPLA (Meredith 2006: 600-601). The period marking the start of the democratic transition in Angola began after 16 years of civil war and more than 350,000 deaths. In 1991, the first real attempt at democracy was made as negotiations were brokered between Savimbi and dos Santos in Portugal. As a result, a small U.N. mission was dispatched to Angola—the UN Angola Verification Mission (UNAVEM)—with responsibility for tracking ceasefire agreements, verifying demobilization efforts, and monitoring the electoral process, which was to consist of competitive multi-party elections (Minter 1994: 54); unfortunately, the mission was later condemned as “woefully short-staffed and poorly funded” (Minter 1994: 54) and referred to as “a UN peace mission of absurd incompetence” (Judith Matloff in Meredith 2006: 606). The elections that ultimately took place in September 1992 “proceeded in a peaceful and orderly manner” with a high voter turnout of about 90 percent (Minter 1994: 54-55). To the surprise of many, UN monitors decided that, “although irregularities had occurred, there was no evidence of fraud on a major scale” and the elections were thus determined to have been “generally free and fair” (Meredith 2006: 608). Nevertheless, shortly after the elections Savimbi issued an ominous message over an Angolan radio station stating his indifference to “any international organization saying that the elections were free and fair” (Meredith 2006: 607). When results were announced, giving dos Santos 49.6% over Savimbi’s 40% and by law requiring a runoff election, Savimbi promptly rejected the results and sent the country once more into war. This time, “It was a war to satisfy the ambition of one man [Jonas Savimbi] to hold absolute power” (Meredith 2006: 609). In the period following Angola’s first failed attempt at democracy, violence escalated to a level “exceeding that of the entire previous period” (Minter 1994: 55). Two more attempts were made to reach peace deals, in the background of all-out civil war, including the 1994 Lusaka Protocol and the 1997-98 establishment of a national unity government (Meredith 2006: 611-12). However, the conflict at this point was characterized by Savimbi’s refusal to accept even the slightest compromise. The unity government therefore quickly collapsed, and it was not until Jonas Savimbi was killed in combat in 2002—after four more years of brutal conflict—that the peace process, and the transition toward democratic government, gained any forward momentum. Only two months after Savimbi’s death, a peace agreement was signed. A report by Freedom House later recounted the post-election atmosphere, noting, “UNITA appeared committed to peace and subsequently transformed itself into Angola’s largest opposition party. About 80,000 former rebel soldiers were demobilized, and 5,000 were integrated into the armed forces and police” (Freedom House 2009). These agreements were promptly formalized between UNITA and MPLA forces as the Luena Memorandum of Understanding, representing a major breakthrough in the peace process. The end of large-scale violent conflict has been an important turning point for Angola. But despite the laying aside of arms, the MPLA today remains “an authoritarian party in the hands of a small elite… long accustomed to wielding power in an arbitrary manner and to enriching themselves from the business of government” (Meredith 2006: 602). The MPLA won more than 80 percent of the seats in the National Assembly during 2008 legislative elections (the first since 1992), but Freedom House noted, significantly, that the elections did not meet the criteria requisite of “free and fair” elections, and furthermore, that the executive branch continues to create the vast majority of new legislation (Freedom House 2009). --. “Background Notes: Angola.” U.S. Department of State, 2009. Retrieved from: . --. “Marching towards riches and democracy?” The Economist, August 2008. Global Witness. “Will Angola Finally Publish Its Oil Accounts?” Review of African Political Economy. 30.98. December 2003: pp 685-686. Handelman, Howard. The Challenge of Third World Development (5th edition). Upper Saddle River: Prentice Hall, 2009. Henderson, Lawrence W. Angola: Five Centuries of Conflict. Ithaca [N.Y.]: Cornell UP, 1979. Karl, Terry Lynn. The Paradox of Plenty: Oil Booms and Petro-States. Berkeley: University of California Press, 1997. McMillian, John. “Promoting Transparency in Angola.” Journal of Democracy. 16.3. 2005. Meredith, Martin. The Fate of Africa: A History of Fifty Years of Independence. New York: PublicAffairs, 2006. Minter, William. Apartheid's Contras: An Inquiry into the Roots of War in Angola and Mozambique. Johannesburg: Witwatersrand UP, Zed Books, 1994.